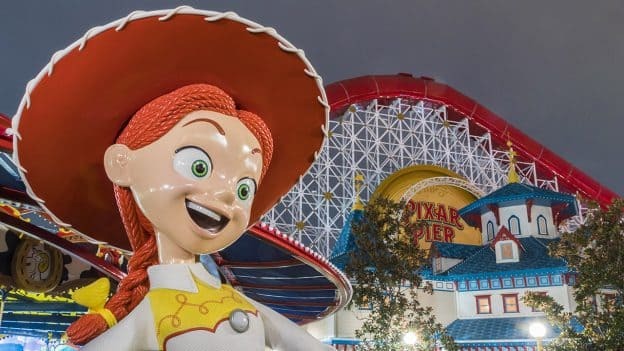 Pixar Pier, the reimagined land in Disney California Adventure park, shares the stories and characters of Disney•Pixar films with exciting attractions, themed neighborhoods and fun eateries. Today, we’re excited to share Jessie’s Critter Carousel will open in April! Sure hope to see you over at Jessie’s Critter Carousel when you visit Pixar Pier at Disney California Adventure park! I found it weird that character's eyes were totally focused at looking down the female cast member's shirt as she worked the cash register. I really like the angle of that picture. It really captures some nice colors. not to sure about the giant Jessie though, I'm sure it will look ok especially since there is a giant potatoe a few feet away. I just wish they would have gone with something that at least partially moves. One of the worst things about Pixar Pier is that they just drew a “border” down the middle of the land and renamed the untouched area Paradise Park even though the layout still obviously functions as one land. Their is nothing that makes you feel as if you re leaving Paradise Park and entering Pixar Pier especially on the Silly Symphony side. The more you think about the more mind boggling these decisions at DCA become. You just don’t understand what consumers demand and it’s elitist of you not to like it. Paradise Pier is better than abandoned attractions. This carousel with all-new seating replaces King Triton’s Carousel, which opened with the park and offered marine animals to sit on, such as dolphins and whales. >There’s a new carousel in town, and it’s about to open. It’s been a year since the popular King Triton’s Carousel was shut down at Disney California Adventure, in order to be remodeled into a new one themed after the “Toy Story” movie series. I once got bit by a snake (not a rattler), so it's safe to say I won't be going anywhere near this. Ouch. Did you find it in your boot? When did Triton’s (RIP) close? How long did this conversion take? It closed March 5th. It took more than a year!! Can’t wait to ride the best themed carosuel in the world! Was there actually any work visually done to the carrousel before last November? I don't think so. I think Disney had just put up the decorative walls. Well they did waste their money on 50lbs of glitter. That was a really stupid idea. Phase 3 of Pixar Pier will be bringing back Dinosaur Jack’s Sunglass Shack and renaming it Dinosaur Arlo’s Sunglass Shack, just in time for The Good Dinosaur 2: What Killed The Dinosaurs? The Ice Age (6)!